To most people feeling tired is a result of not getting enough rest. Achy joints or muscles for most will seem as a result of intensive exercises. Symptoms of abdominal pain, constipation, or diarrhea can easily be swept under the rug and blamed on a bad meal. Nevertheless, the above symptoms are only temporary for most people. Getting enough rest and some time to recover, or cleaning up their diet and those people will be back to their normal condition. However, if you’re suffering from an autoimmune disease when your body is attacking itself, these symptoms are more severe and debilitating. And they could potentially be festering into another autoimmune disease. About 25% of those with autoimmune diseases have a tendency to develop another autoimmune disease causing more complications. The epidemic of autoimmune diseases is booming in the 21st century. Why is so many people’s immune system is turning on them and attacking healthy tissue? Many doctors and patients point to genetics – saying that you were bound to get it someday. However, genetic predisposition accounts for only 30-50% of autoimmune diseases, while environmental factors account for the rest, 50-70%. Toxins, unhealthy diets, and stress are everyday factors in the world we live in. These environmental triggers set off an imbalance in your body including hormonal imbalances, gut dysbiosis, oxidative stress, mitochondrial dysfunction, and neurotransmitter imbalances. These imbalances alter your defense mechanisms leading to more infections and possibly to an autoimmune disease. Fortunately, you can manage these environmental factors. And possibly you may be able to prevent or even reverse autoimmune diseases and heal your body. There is a broad spectrum of autoimmune diseases consisting of about 80 different disorders. These types of autoimmune diseases can affect any part of your body, leaving you with a variety of different symptoms. However, at the core of all autoimmune diseases, there’s a glitch in your immune system, which leads to an attack on your healthy organs and tissues. And because of this, a symptom which all autoimmune diseases have in common is some type of inflammation. Whether it be in thyroid, in case of Hashimoto’s thyroiditis, or in the gut, in case of Crohn’s and ulcerative colitis, or in a central nervous system (neuroinflammation) in multiple sclerosis. Wherever it is, the body is inflamed and under attack. Our immune system is specifically wired to protect us from foreign invaders including parasites, harmful bacteria, and viruses. Due to genetic predisposition and other environmental factors, our immune system may sometimes fail to recognize these foreign invaders. This can lead to a chronic inflammation. Let’s face it, our immune system is not like our brain or heart where you can point to an exact location or particular parts of the body. Our immune system is an intricate system working with multiple different systems to keep us safe. However, according to a fairly new research, close to 80% of these working systems are related to our gut. That is why gut health has become so important within the autoimmune disease community. Autoimmune diseases can be tricky to diagnose because of the wide range of symptoms affecting multiple parts of the body. Autoimmune symptoms can easily be mistaken for bothersome symptoms that don’t require immediate attention. But those symptoms could just be the canary in the coal mine alerting you of a weakened immune system. Since autoimmune symptoms tend to be somewhat vague, the actual disease might not apparent until years later. For that reason, curing autoimmune diseases can be difficult because, by the time you develop autoimmunity, some organs may be already damaged. If you are experiencing any combination of these symptoms, talk to your alternative or integrative medicine doctor because you may have an autoimmune disease. If you have a family history of these diseases and multiple environmental factors, which play a role in autoimmunity chances are higher you can develop an autoimmune disease. But with some work with your doctor, you both can work on an integrative approach for your autoimmune disease. Talk to your integrative medicine doctor today if you experience any of the above signs of a weak immune system. Alternative medicine treatments are essential in reversing autoimmune diseases and healing your body. Because it’s not only about genetics – environmental factors have the strongest influence on your health. Identifying environmental triggers such as evaluating for toxins, testing gut health, recognizing stress, and evaluating your diet helps to pinpoint what has set off your autoimmune disease. 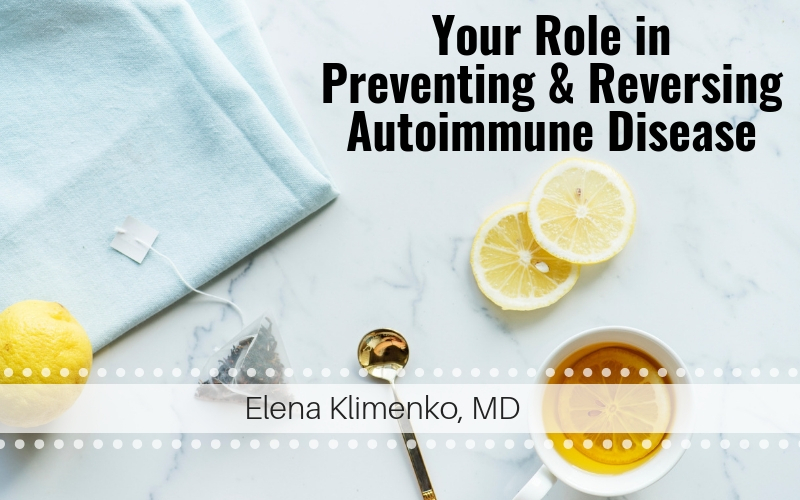 Request an appointment today with Dr. Elena Klimenko to experience her integrative approach in the healing of autoimmune diseases. This functional medicine doctor uses genetic testing, blood work, advanced stool testing, and many other advanced methods necessary to first uncover the root cause of your disorder, and then heal your body through functional and integrative medicine approaches such as IV therapy, acupuncture, homeopathy, etc. You can also call at (212) 696-4325 to make an appointment with this NYC practice.